A common objective from marketing campaigns is to generate interest in an organisation's website. Inserting a link from an email or landing zone to a page on a website can generate lots of interest. Highlight the text you wish to link to a website. Click on the Insert Web Link icon on the right hand side of the Editor. Using this icon will ensure that the link is trackable within the product, so that you can see the click through on the results of the campaign. Enter an Alias for the link. This is optional but the Alias will show in the results of the campaign which can make reporting easier. 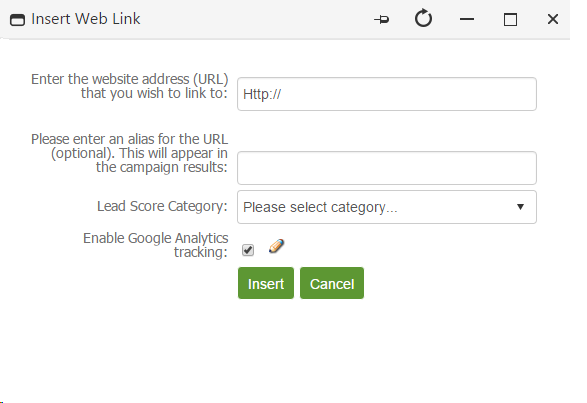 Select a Lead Score category if you use Lead Scoring. Enable Google Analytics if you use Google Analytics on the URL that you are linking to. Click insert once you are happy, to insert your link.